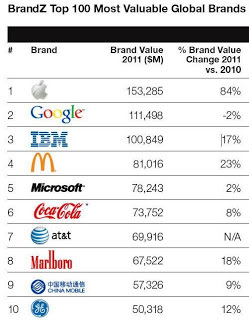 In a report released today, Apple has surpassed Google as the world’s most valuable brand. Apple is reportedly now worth $153 billion, de-thronging Google who held the rank for 4 consecutive years. The report, released today by BrandZ, who conducts a study of the world’s top 100 brands each year, was released in London, U.K., where WebiMax recently opened an international office. Apple’s world renowned product portfolio includes the iPhone, iPad, iPod, iMac, MacBook, and other consumer technology goods. Last year, Apple surpassed tech company Microsoft, for world’s most valuable technology firm. Although Google offers an extensive product portfolio themselves, demand for Apple’s savvy products have had an ever presence in households all over the world. The full list can be found here, courtesy of BrandZ.